How stress affects your work and better ways to manage stress. Running your own business can be a dream come true, but it’s a stressful experience. 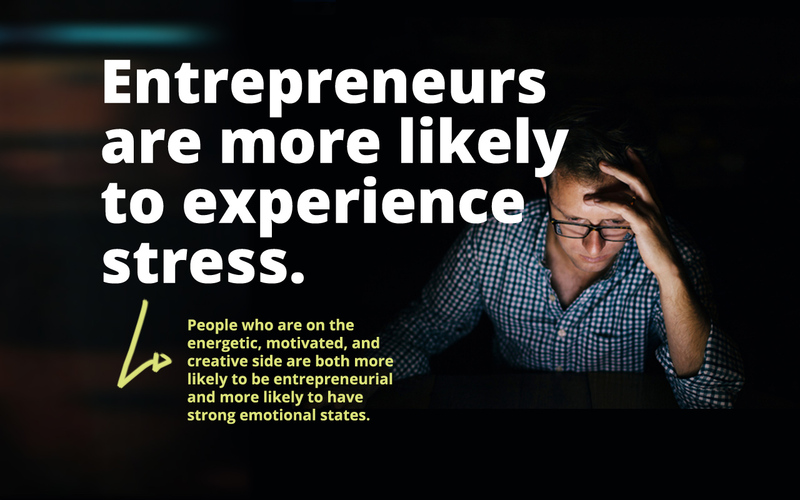 People who are on the energetic, motivated, and creative side are both more likely to be entrepreneurial and more likely to have strong emotional states. As business owners, we tend to conflate our sense of self with the success of our businesses, which can increase our stress levels. Mark Woeppel, founder of Pinnacle Strategies management consulting firm, was doing well until the global financial crisis hit his company so hard he had to lay off all his employees and sell his assets. Woeppel says the year when his company was on the brink of collapse helped him disentangle his self – esteem from the success of his business, but it wasn’t easy. 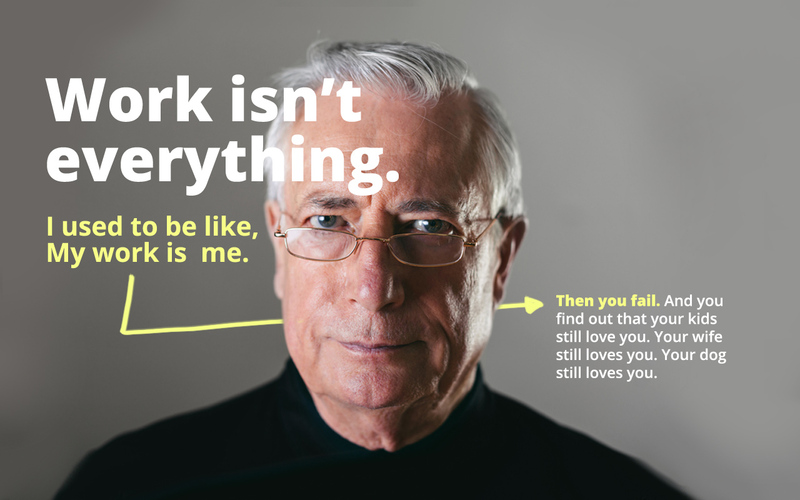 I used to be like, “My work is me.” Then you fail. And you find out that your kids still love you. Your wife still loves you. Your dog still loves you. It sounds easy on paper, but it can feel impossible to look at your business objectively when you built it yourself, out of nothing. Which leads to ever – increasing stress to keep it running, keep it growing, and not screw up what you’ve built so far. So, since we’re so prone to stress as business owners, what can we do to manage its symptoms? First, we need to understand how stress works. Acute stress is the most common form. It’s the short – term stress that comes from obvious triggers like running late for work, or being involved in a vehicle accident. 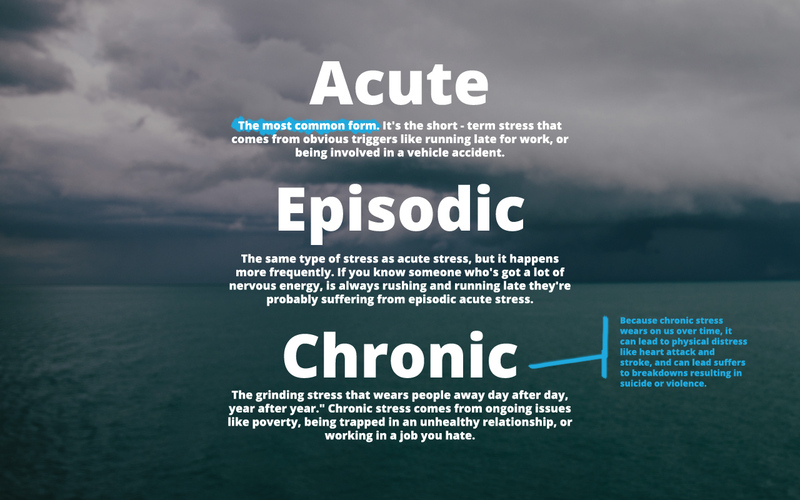 Episodic acute is the same type of stress as acute stress, but it happens more frequently. If you know someone who’s got a lot of nervous energy, is always rushing and running late, or is constantly tense about something in the future, they’re probably suffering from episodic acute stress. Often, lifestyle and personality issues are so ingrained and habitual with these individuals that they see nothing wrong with the way they conduct their lives. Clearly, this isn’t something we want to experience. But stress isn’t necessarily bad—at least, not always. We experience stress for a reason, and our body’s response to stress can be beneficial in the right circumstances. When we feel stressed, it’s because our bodies are responding to a perceived threat. Whether that’s working on a tough legal case, falling behind on a large job, or dealing with angry customer. Our brain secretes hormones that cause our bodies to respond by increasing our heart rate and blood pressure, causing our kidneys to increase the re-uptake of water so we don’t produce as much urine, and burning off glucose and fat deposits to increase the amount of energy we have to work with when facing whatever threat is stressing us out. This might feel uncomfortable at the time, and in fact, most of us think of being stressed as a bad thing, so these signs tip us off that something bad is happening. 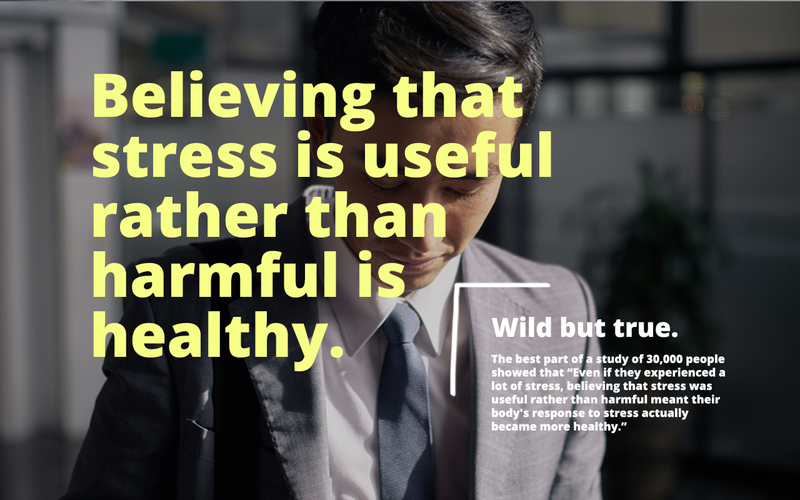 However, Psychologist Kelly McGonigal pointed out in her TED talk that recent studies have proven the stress response doesn’t always mean something’s wrong. McGonigal shares a study in her talk that followed 30,000 people in the U.S. over eight years. The study asked participants how much stress they’d experienced in the past year, and whether they felt stress was harmful to their health. Then, the researchers looked at death records each year to see which participants died. Here’s the best part: the participants who had the lowest risk of dying during the study were not those who experienced the lowest amount of stress. In fact, they were the people who said they didn’t believe stress was harmful to their health. Even if they experienced a lot of stress, believing that stress was useful rather than harmful meant their body’s response to stress actually became more healthy. And McGonigal explains why: another study showed that the body’s stress response actually becomes more healthy when we believe it can be beneficial to us. When you believe that your fast – beating heart is helping to pump blood through your body so you can react quickly, your fast breathing is due to more oxygen being pushed to your brain so you can think quickly, and the reason you’ve stopped feeling hungry or thirsty is because your body’s focusing all your energy on dealing with the immediate threat, you’re rethinking your stress response as a helpful experience, not a harmful one. When we feel stressed, our blood vessels tend to constrict. Narrower blood vessels can be dangerous if they stay that way long – term (i.e. if we invoke our stress response often), which is why chronic stress is often linked to heart disease. But McGonigal shares a study that found in participants who viewed their stress response as helpful, the blood vessels didn’t constrict. Their blood pressure still increased, but their stress response had actually become more healthy. Beyond rethinking the stress response, there are several ways we can avoid feeling stressed in the first place. Stress often crops up when we’re feeling overwhelmed or lacking confidence about the future. Though these feelings are common for business owners, it’s possible to alleviate them with solid planning and focusing techniques. When I figured out a way to plan my days that helped me feel in-control and less overwhelmed, I felt my stress levels go down immediately. I’ve also found planning for the next day before I go to bed helps me rest easy, knowing I’m prepared for what tomorrow holds. You may also find prioritizing your to do list and delegating to colleagues can help you feel less overwhelmed, and less stressed as a result. I’ll explore techniques for focusing and prioritizing in more detail in a future article, but for now let’s look at how to deal with stress when it hits you. 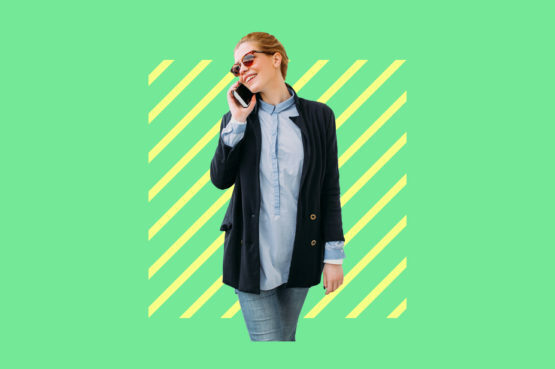 If you, like so many other business owners, tend to feel more stress at work than you’d like to, try incorporating some of these activities into your workdays. Laughing makes you feel good—we all know that. But researchers working on a study in 2006 found that even anticipating laughter can reduce stress hormones in the body. The researchers split participants into two groups, and told one group they’d be watching a humorous film later on. The group that anticipated the funny film had higher levels of hormones that help alleviate depression and improve the immune system. A later study using the same approach found the participants who anticipated watching the funny film also had lower levels of three hormones that play big roles in the stress response. Another study from the Netherlands tested happiness levels in employees who took vacations—as they planned the holiday, during the trip, and afterwards. The highest happiness levels came during the period of planning—from the anticipation of the vacation. So even if it’s not a funny film, planning something fun to look forward to could prevent you from getting stressed in the first place by improving the positive hormones in your body. Try planning something to do after work each night or every weekend that you’ll look forward to, so you get a regular dose of happiness-inducing hormones. Maybe meditation is your thing. Or maybe you love doing yoga. Or perhaps praying is what calms you. Any of these activities can activate your “relaxation response,” according to scientist Herb Benson from Massachusetts General Hospital. The relaxation response that occurs when we engage in activities like meditation and yoga changes the activation of some of our genes—the same genes that are at work in post – traumatic stress disorder. Only the relaxation response does the exact opposite of what stress does to these genes, and the results last much longer. So find something you love to do that makes you feel calm and relaxed. It could be knitting, walking, or even listening to your favourite music. Exercise has been shown to increase happiness and decrease stress levels. One study showed the cause for this link may be related to a neuropeptide called galanin. Neuropeptides are small molecules that our neurons use to communicate with each other. The study showed that galanin protects neurons from stress – related degeneration, and exercise was shown in 2012 to increase galanin levels in a key stress – handling area of the brain. So find some exercise you enjoy, and do it often. 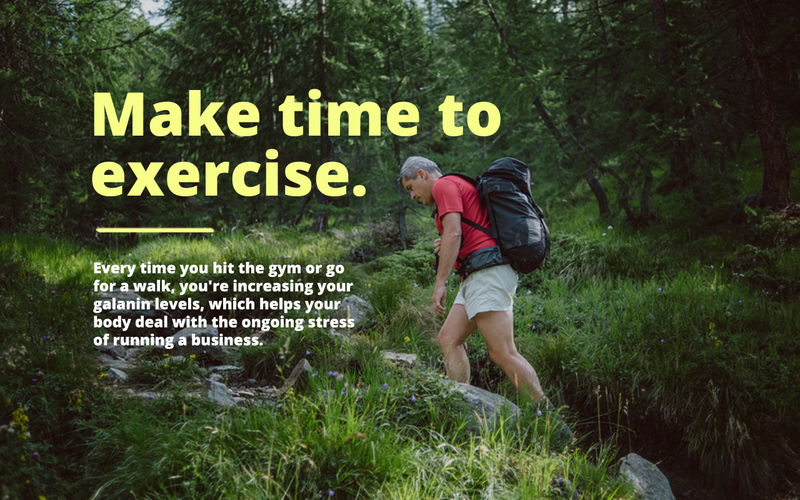 Every time you hit the gym or go for a walk, you’re increasing your galanin levels, which helps your body deal with the ongoing stress of running a business. Though it may sound silly, research has proven that talking about your feelings can decrease your stress levels. The key is to talk to someone who feels the same way, so you get that “we’re all in this together” feeling. The study tested stress hormone levels in participants who were asked to give a speech while being filmed. Clearly, a stressful situation. Researchers found talking to someone else who was about to go through the same experience decreased stress levels. Perhaps this is why it’s so beneficial to go into business with a partner, rather than alone. If you don’t have a business partner to share your stress with, try setting up a coffee or joining a meet-up group with other business owners. While stress is something everyone deals with, business owners have more than our fair share. 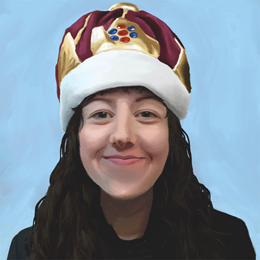 Running your own business means wearing lots of hats, taking on huge responsibilities, and constantly dealing with the unexpected. But stress doesn’t have to be your downfall. Rethinking your stress response can help you encourage a more healthy physical stress response, and there are many ways to cut down on the amount of stress you experience. Overcoming the temptation to multi-task and scatter your attention can make a huge difference to your stress levels, as well as helping you get more done. 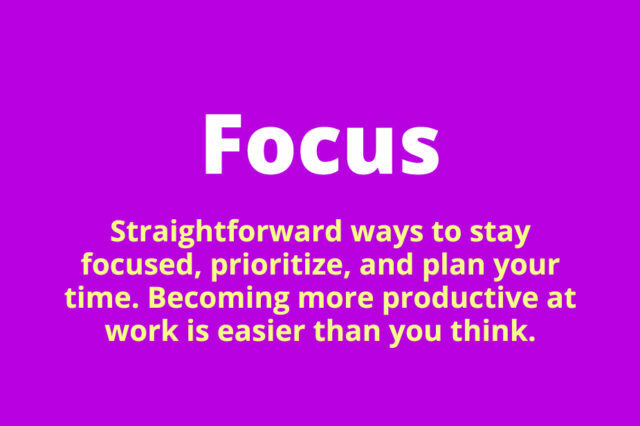 In a future article I’ll explore ways to improve your focus to help you be more productive, and avoid some of the inevitable stress that comes with running your own business.